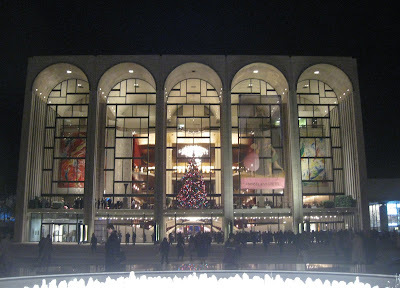 There's nothing like going to the Metropolitan Opera during the holidays! 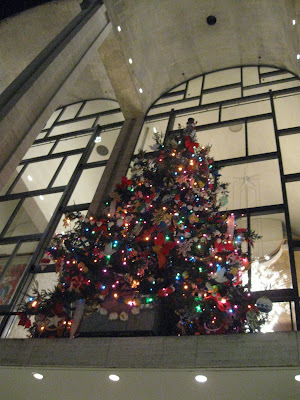 But, Elektra is no holiday show. And even though it's about a family gathering, this one's a little more dysfunctional than the proverbial holiday gathering. Oh the pathos, the angst, mistaken identity, the murder and mayhem! Unfortunately, there's no happy ending either. But with this opera by Richard Strauss, you get some of the most beautiful and powerful music ever written. On top of this, add some of the biggest, most beautiful voices in the world. And it's all packed tightly into just around 120 minutes with no intermission. In this production by Otto Schenk, there's only one set that looks like the outside of a ruined temple. Scene changes are only achieved by lighting. The orchestra pit was overflowing with string, and brass and percussion. They sounded glorious, even if they dragged a bit under Maestro Fabio Luisi's baton (Sally says most productions are about 1 hr, 45 mins - last night was just about 2 hours). 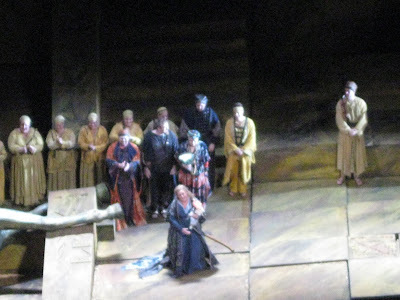 Orest was played by bass-baritone Evgeny Nikitin finely with a very rich voice. And although Oreste returns to save the day, this show is about the ladies. Felicity Palmer was delightful as the evil mother Klytamnestra. She played her slitheringly and ghoulishly. And while this mother is quite detestable, I couldn't help but chuckle at Felicity's characterization. 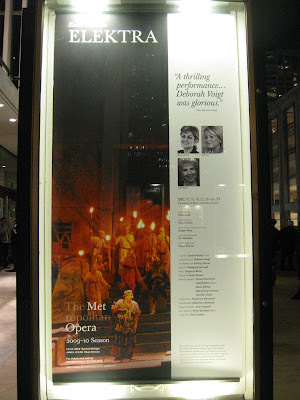 But stealing this show was Deborah Voigt as Chrysothemis. She sounded in better voice than I have ever heard her live. I was absolutely moved to chills by her longing for her family. Her voice was so clear, strong, controlled, loud and beautiful last night, we wondered if she should haven't changed roles with Susan Bullock. I always love seeing Maria Zifchak and Jennifer Check as unnamed cast members - it's always so fun to pick them out and of course, they stand out from the crowd with their gorgeous voices and acting. I have already seen each of them several times this season. Felicity, Susan and Deborah all received bouquets of flowers, thrown on to the stage by appreciative audience members...but delighting the crowd was Deborah, who caught hers like it was a game winning pass. 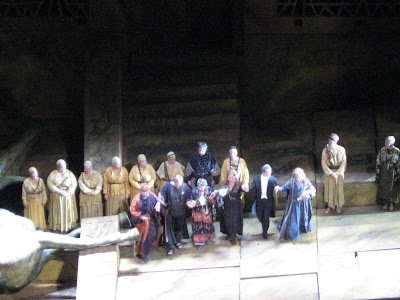 We waited a long time to see Elektra at the Met, for Sally's sake. It was almost just as fun watching her on the edge of her seat as it was the action on stage. And afterward, we celebrated with martinis.